- 1% ~ 99% adjustable duty cycle for Square Waveform. - Waveform parameter setting through numeric keypad entry & knob selection. 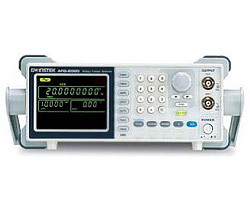 - AM/FM/FSK Modulation, Sweep, and Frequency Counter functions (AFG-2100 only). - USB Device interface for remote control and waveform editing.